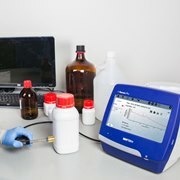 Using see through Raman technology, B&W Tek’s i-Raman Pro ST high throughput portable Raman system dramatically enhances the Raman signature of the content, allowing for identification of materials through opaque containers such as white plastic bottles, paper envelopes, tablet coatings and more. The system is able to identify materials through barrier layers, measure dark materials and provide consistent, accurate measurement of non-uniform samples using deep cooling and a high throughput spectrometer to give a strong signal and excellent stability over longer integration times. It also features a large sampling area that significantly improves analysis reproducibility for heterogeneous samples and minimizes power density, which allows for the measurement of darker materials that would be susceptible to photo damage under conventional Raman spectroscopy. The i-Raman Pro ST utilises the company's smart software that provides easy identification, quantification and data processing capabilities.